All our cheese is made with Jersey cows’ milk and aged at least 60 days. The creamy texture of our blue cheese, is like none elsewhere. We dip the newly-made wheels in our own apple cider daily for 3 days. This 2-3 month-old, raw cow milk cheese has a moist yet semi-firm texture and finishes with a tangy, blue flavor. 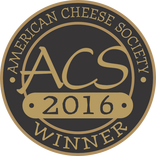 This cheese won first place at the 2016 American Cheese Society awards. 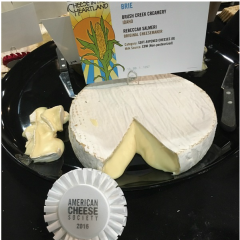 Our award-winning brie is made from raw cow milk. The cheese is aged to a creamy, rich perfection at 60 days. It has a thin, edible, bloomy rind that encases the velvety, yellow center. There is a distinctive bite with a pronounced finish that lingers. 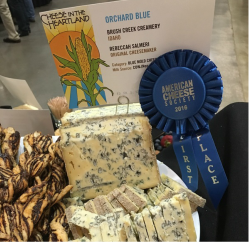 This cheese won third place at the 2016 American Cheese Society awards. This award-winning brie is made from raw cow milk. The cheese is aged to a creamy, rich perfection at 60 days. It has a line of vegetable ash in the center and is wrapped in local grape leaves that have been boiled in wine and then it is wrapped in twine. 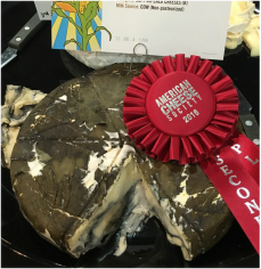 This cheese won second place at the 2016 American Cheese Society awards. We wrap this award-winning brie in mountain maple bark and top it with a local grape leaf boiled in wine. This brie is made from raw cow milk and aged to a creamy, rich perfection at 60 days. 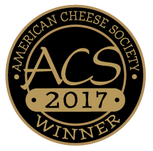 This cheese won first place at the 2016 & 2017 American Cheese Society awards. 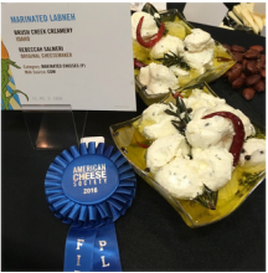 To create this award-winning Mediterranean soft cheese, we make yogurt with pasteurized cows milk and drain it through cheesecloth until it is thick. We then spice it with fresh garlic, parsley and salt. We shape it in balls and drop it in olive oil with peppercorns, fresh herbs and dried red pepper for garnish. Delicious on pita bread and crackers or as a vegetable dip. Use the flavored oil on salads. ​CHEDDAR: Our clothbound cheddar is aged in the traditional method of wrapping in cheesecloth instead of vacuum-packaging, which allows it to breathe. It develops a nutty flavor after 6 months. FETA: This whole, raw cow milk cheese is aged in a whey brine for 60 days resulting in a creamy texture paired with tangy, savory taste. MARINATED FETA: Made with whole raw cow milk and aged 60 days, this feta has a bold aroma with a firm but delicate texture. The cheese, marinated in extra virgin olive oil, red wine vinegar, fresh garlic and an assortment of herbs, provides for a unique combination of complementary flavors and textures. Use the flavored oil on salads or on bread. MONTASIO: Pronounced Mon-tah-see-yo, this is an old Italian monastery recipe. When aged for 8 weeks it has a creamy texture, but after a year of aging it develops a sweet, caramelized flavor.